The achievement of this bill is $900 billion to help people purchase health-care coverage, a new market that begins to equalize the conditions of the unemployed and the employed, and a regulatory structure in which this country can build, for the first time, a universal health-care system. Thousands and thousands of lives will be saved by this bill. Bankruptcies will be averted. Rescission letters won't be sent. Parents won't have to fret because they can't take their child, or themselves, to the emergency room. This bill will, without doubt, do more good than any single piece of legislation passed during my (admittedly brief) lifetime. If it passes, the party that fought for it for decades deserves to feel a sense of accomplishment. Sorry for turning this blog into an Ezra Klein appreciation society, but when someone is that good they should get their props. I entirely share Ezra's concern that this bill, potentially the greatest victory for Progressive Americans since Roosevelt passed Social Security (and in one stroke solved the problem of drastic poverty amongst seniors), may wind up with liberals achieving a victory and declaring defeat. And in any case, although I want a public option, but I'm just not convinced it's anywhere NEAR as important as other features of the bill that seem to get much less attention. Consider, for example, the case of the Medicare Commission - which was quietly killed in the House and is threatened in the Senate. By taking control over Medicare costs away from the politicised congressional process and putting it in the hands of actual, ya know, health care types this feature could do more to cut the cost of health care in a stroke than the fairly weak-tea public option currently proposed ever could. But I bet you'd never heard of the Medicare Commission proposals until now, right? Copenhagen Summit - Promising Signs! I have to admit to being a Copenhagen Summit pessimist. Although I've always thought that it was vitally important to achieve international agreement on some agressive target to curb global warming soonest, it has seemed increasingly likely lately that no such bold agreeement is on the cards. I thought Obama had a moral obligation to attend the summit, and for his administration to commit to the strongest deal they could get, but I was fairly unsurprised when I head that Obama would make a fairly low-key stop in Copenhagen in the first week of the Conference. So imagine my pleasant surprise to learn that Obama has now rescheduled his Copenhagen trip to attend the end of the Summit, when 80 other world leaders will be present. Rumours are that this change of plans is a reaction to the better-than expected deals being struck with critical but hard to persuade big polluters such as China and India. If he’s willing to stick his neck out like this, Obama must be pretty confident that he can get a deal. There have been signs of momentum for weeks now. The much-discussed deal with China was just one in a raft of commitments from the developing countries, including India and Brazil. Movement from the developing world has undercut one of U.S. conservatives’ principal arguments for inaction. Over 65 world leaders have pledged to attend. And did I mention jobs? Do make sure to watch this video - trust me, two minutes nineteen seconds well spent. This is good stuff. As I reported before, it's not quite enough or as much as we'd like. But it's a damn sight better than nothing, or the less than nothing that the Republicans' "let's freeze federal spending" economic plan would have led to. After what felt like a ver frustrating delay (why could Amazon get the last Harry Potter to me by 8AM on release day, but I had to wait two days for this? Isn't David Plouffe at least as culturally significant as the Boy Wizard?) I finally received the book and have been combing through it with great interest. I'm not going to do a formal book review or anything - but in general The Audacity to Win is clearly written and inciteful. There are some surprises and a lot more detail about campaign moments that many of us followed obsessively but never knew the whole story. But then, I'm a bona fide Plouffe groupie, so perhaps my review is about as unbiased as a 14 year old girls thoughts on Twilight. To the extent that the book has a weakness so far, I have to say I'm slightly irritated by the extremely long perfectly constructed paragraphs of clean text that are quotes verbatim - surely no one really sounds like this in actual conversations, and even if they did I doubt that Plouffe would have been recording or note-taking in enough detail to capture the wording years later. But still, I'm sure what he's reporting is a fairly accurate rendering of the content of conversations even where I have doubts about the word choice. 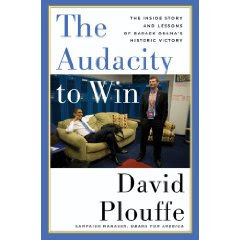 And there is an especially striking conversation that Plouffe reports between himself and Barack in Spring of 2007. At this point, Barack has launched his campaign successfully and has made a very strong showing in the early fundraising. But the pressures of a national campaign are wearing on him, and he is, frankly, not campaigning well. He's bored, tired and grouchy. In April, Spokesman Robert Gibbs decides to have a heart to heart with Obama on the campaign plane. "Are you having any fun at all?" he asked him. "Do you see any way we can make it more fun?" Gibbs replied. Reggie Love, who was listening in on the conversation piped up, "Well if it's any consolation, I'm having the time of my life." "Maybe you shouldn't have run... But you did, and the one thing that won't happen is that you'll quit. So let's at least give it a go, try to enjoy ourselves. Worse case, in eight or nine months we'll be out and have nothing but time on our hands. This is hard enough firing on all cylinders -- it's unbearable if your heart is not one hundred percent in it." He thought about it for a moment. "I guess it's like being in the middle of the ocean. It's the same distance to swim back as to keep heading across. Just tell me this is going to get more fun." Well, I think it did get more fun. But it's chilling to hear him talk about things in those terms - what if he'd been a few yards closer to the near shore? Ezra says (and thanks to KathyF for pointing it out to me) that the article I quoted in my last post was not an accurate reflection of the CBO report. In truth, says the Prophet Ezra, the 10-15% increase in the predicted average premium is based entirely on an assumption that people will chose to buy more expensive plans. The idea is, as I understand it, that because many people will be able to offset their health insurance with government subsidies, some people will chose to purchase better coverage than they could otherwise afford. First, the bottom line of the report is simple: The CBO says premiums will go down for the vast majority of Americans, and that the same insurance policy will cost less under reform. The confusion comes in the CBO's analysis of the individual market, which serves about a tenth of the population. CBO expects prices in the individual market to rise by 10 or 12 percent, an expectation driven entirely by predictions that individuals will purchase policies that are much more comprehensive, and thus somewhat more expensive, then the insurance they can afford now. Then the CBO turns to look at the impact of the subsidies, which will cut premium costs by a bit over 50 percent for a bit over 50 percent of the market. But as the CBO explains on page five, part of the increase in the type of insurance being purchased is the result of "people’s decisions to purchase more extensive coverage in response to the structure of subsidies." In other words, the change is driven by the subsidies, not offset by them. Meanwhile, as I understand it, the tax on "Cadillac" plans - health insurance that offers little to no additional health outcomes, but a more lusurious service will tend to discourage people from buying these plans (though of course anyone is still free to do so if they wish). On average, then, under the new legislation most people will wind up with a plan somewhere in the middle of the cost charts - robust enough to cover all chronic conditions and to prevent health bankrupcy, but using the power of the market to discourage people from wasting medical resources where they could be better used. This stuff is complicated, and I'm no expert. But I trust Ezra on this issue more than me, so go read him. As we edge (creep, crawl, inch, take baby steps - insert your own word for mollases like progress) closer and closer to passing comprehensive health insurance reform, those of us who support the bills have been hoping that one effect they would have would be to lower the out of pocket costs of buying healthcare. Well it turns out that most people's day to day costs WILL in fact be lower (phew), but that premiums themselves are likely to go up slightly. How can this be so? According to CBO, average premiums in the individual market would increase 10 to 13 percent because of provisions in the Senate health care bill, but, crucially, most people (about 57 percent) would actually find themselves paying significantly less money for insurance, thanks to federal subsidies for low- and middle-class consumers, than they would under current law. Separately, for those who have high-end employer-provided insurance, CBO finds that a new excise tax on high-end policies will have disparate effects on premiums. Those who keep their "cadillac" insurance would end up paying higher premiums than they do today, and those who choose instead to choose less luxurious policies would pay lower premiums. "[P]eople who remained in high-premium plans would pay higher premiums under the excise tax than under current law, and people who shifted to lower-premium plans would pay lower premiums under the excise tax than under current law," the report reads. But CBO also finds that on average, people who have plans susceptible to the 40-percent tax will ultimately be paying less in premiums than they would without health care reform: "On net, CBO and JCT estimate that the excise tax and the resulting behavioral changes...would reduce average premiums among the 19 percent of policies affected by the tax by about 9 percent to 12 percent in 2016." This report alleviates a major concern that has been raised--that insurance costs will go up across the board as a result of this legislation. "This study indicates that for most Americans, the bill will have a modestly positive impact on their premium costs. For the remainder, more will see their costs go down than up. Hopefully, we can continue to focus the Senate debate on additional ways to make health insurance even more affordable for all Americans."